What is it: An opaque, densely pigmented liner with all-day wear that's gentle enough for tight-lining but strong enough to withstand a tough workout or hot, humid weather. Why it's different: This transfer-proof liner instantly forms a waterproof film that stands up to sweat, humidity, tears and more. For minimal smudging and intense definition, it's formulated with the lowest possible level of oils and waxesthe result is pure, crisp color payoff that doesn't fade or fall out. 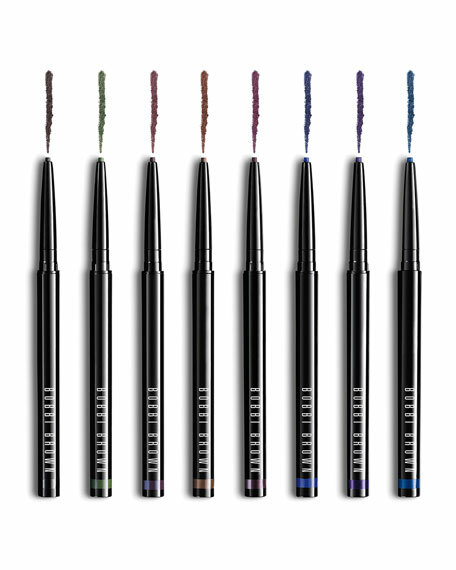 The pigment-rich formula glides on lids evenly for smooth, uniform application and the precise, swivel-up pencil lets you create a range of liner looks. Can be used for tight-lining along the waterline. How to use it: Apply as close to the lash line as possible and line the entire length of the lid using short, even strokes. Deep Sea  A royal blue. Evening Sky  A rich black blue. Rich Plum  A rich plum. Rich Ivy  A rich evergreen. Black Smoke  A rich black grey. Black Chocolate  A rich black brown. Hazy Brown  A rich grey brown. Blackout  A dark black.